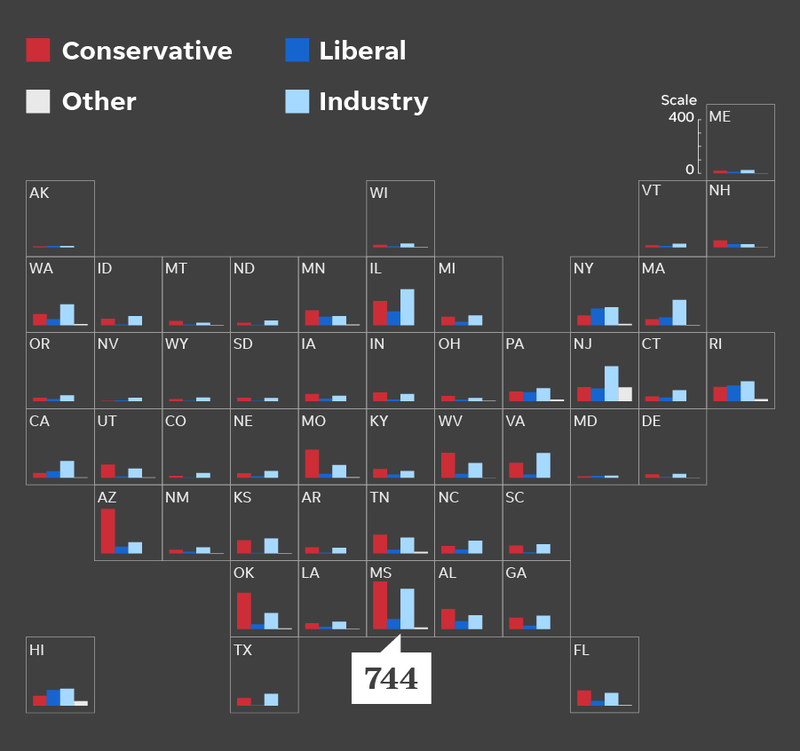 For two years, researchers from USA Today, The Arizona Republic and the Center for Public Integrity have been ingesting the bills introduced in all 50 state legislatures, yielding a corpus of more than 1,000,000 bills, and then consumed months of computer time on a large cluster, comparing these bills to "model legislation" promoted by lobbyists, using a text-mining engine that could identify paraphrases, synonyms, and other techniques used to file the serial numbers off of these bills. They found that more than 10,000 bills that were notionally authored by elected lawmakers drawing a salary at public expenses were actually authored by lobbyists; more than 2,100 of these bills became law. These bills are a wishlist of special-interest legislative favors: limits on your ability to sue a company that injures you, limits on your right to protest, limits on your right to abortion. Many of the lawmakers who signed onto these bills as cosponsors say they had no idea they were supporting "copycat" legislation. Though copycat bills are sometimes right wing, sometimes left wing, and sometimes about enriching a specific industry, the most common political valence of the bills is right wing, and familiar names like ALEC (previously) lead the charge. These bills are given deceptive names ("The Asbestos Transparency Act didn’t help people exposed to asbestos. It was written by corporations who wanted to make it harder for victims"); and they are supported by an ensemble cast of "experts" who rove from hearing to hearing, testifying on the bills; they are often used to overturn local legislation (such as state laws that overturn city ordinances on Airbnb, higher minimum wages, limits on plastic bags, etc); and are a source of enormous profits for the companies that support them ("One that passed in Wisconsin limited pain-and-suffering compensation for injured nursing-home residents, restricting payouts to lost wages, which the elderly residents don’t have. ").